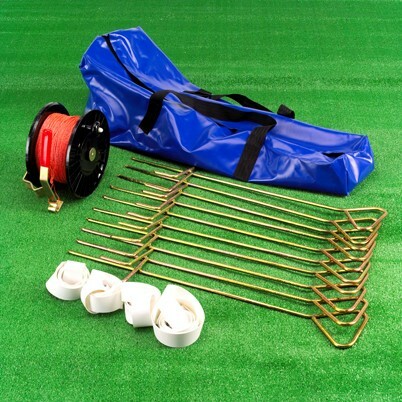 This setting out kit is an extremely useful addition to the groundsman's essentials. The kit includes a 400m handwinder reel with steel cored nylon twine, 10 no. high strength double prong tall tread-in pegs with D handles; 4 no. durable pvc coated webbing right angles with brass eyelets; complete with a pvc kit bag.